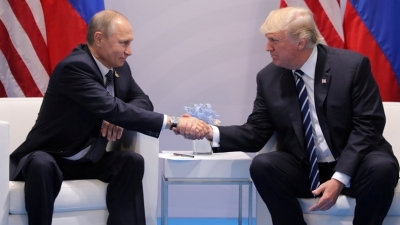 Washington July 14 (IANS) A summit between US President Donald Trump and his Russian counterpart Vladimir Putin will go ahead as planned despite tension over Moscow s alleged election meddling the White House has said. The pair will meet for talks in the Finnish capital Helsinki on Monday the BBC reported. "It s on " White House spokeswoman Sarah Sanders told reporters on Friday after there were calls for the meeting to be cancelled as the US charged 12 Russian intelligence officers with election interference on Friday. For its part Russia said it was looking forward to the meeting. "We consider Trump a negotiating partner " the BBC quoted Kremlin adviser Yuri Ushakov as saying. "The state of bilateral relations is very bad. We have to start to set them right." The announcement that the Russians had been charged with hacking Democratic officials during the 2016 presidential election sparked a heated war of words between Washington and Moscow. During a joint news conference with UK Prime Minister Theresa May on Friday Trump said he would "absolutely" ask the Russian president about alleged election meddling the BBC reported. Russia s foreign ministry said the claims were a "heap of conspiracy schemes" intended to "damage the atmosphere" before Monday s summit. It said there was no evidence linking any of the dozen officials to hacking or military intelligence. But US Deputy Attorney General Rod Rosenstein insisted that "the goal of the conspirators was to have an impact on the election." Top Democrats have urged Trump to cancel the planned summit altogether following the indictment. The 11-count indictment names the Russians defendants alleging they began cyber-attacks in March 2016 on the email accounts of staff for Hillary Clinton s presidential campaign. They are also accused of stealing the data of half a million voters from a state election board website the BBC report said.